We showed up on the first planned day of work and it was absolutely pouring with rain. The workers showed up and got their van stuck in the mud. It took us 20 minutes to get the van out and that was the end of our first day of work. 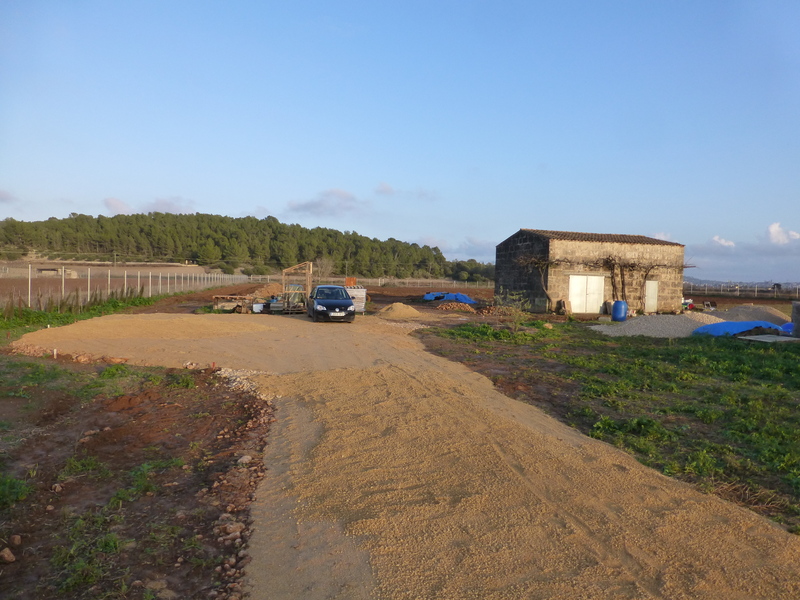 It was clear that if we wanted to be able to get in and out of the plot when it was raining and get materials delivered we were going to have to fix the road. We hadnt planned to do the road so this was the first of our unexpected costs. We got recommended a machine driver by our friendly neighbour and so we called him in to see what he suggested. He suggested to dig down 30cm lay some stone and then pour gravel over the top to level and for the final finish. With that we wouldnt have any more problems. Ohh yes, we started work again three weeks later as that’s how long it took to stop raining. When it rains it pours!! Waste is just something you havent figured out a use for. We were a bit worried about the cost of this as there was about 250m of road plus 150square metres of parking to dig and fill. It was going to need a lot of material. Luckily we demolished the inside of the building which was mainly sandstone and that made a big pile of rubble to put down as a base. This was a great use for it anyway as otherwise we would have had to pay for it to be taken to landfill somewhere else. Here it stays on our land and we turn a waste product into something useful. One man´s waste is another man´s gold! We got the rest of the stones from a neighbours field who has been clearing them for years while ploughing. Then we had some special sand and gravel mix for roads delivered to finish off the job. I had to spend hours raking it to get a nice flat finish and spread the gravel evenly but I’m happy with it now. I found another great use for a pallet while thinking about ways to spread the gravel evenly. I tied a rope to either end of a pallet making a loop. Put it with the slats face down and tied a heavy brick to the top. Next i put the loop around my waist and ran up and down the track. The pallet dug in where there was too much gravel and accumulated the surplus in a mound on top of the slats which then emptied as I went over an uneven bit. Unfortunately I thought of this right at the end but it saved me some work and levelled everything nicely. I got some funny looks from the neighbours driving by , don’t know what they must have been thinking seeing me running around like a plough animal dragging that pallet. Its multiple functions too as I levelled my road and got a good workout. Nothing like pushing or dragging something heavy to get your heart rate going! Here is a quick update of what has been going on in the last couple of weeks. On the first day our builders came in and started knocking the place down immediately. They had the inside completely demolished in the first two days. 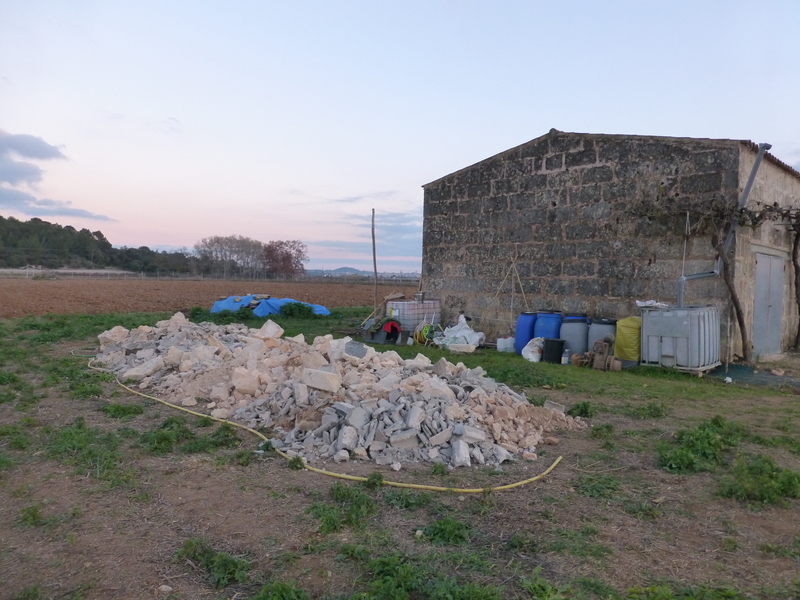 We now had a large pile of rubble that we used as part of the base for our road. The house is an old barn from the 60´s or earlier and so the foundation is just a large sandstone block laid on its side. We thought it might be a good idea to reinforce the foundations with some reinforced concrete. We want to use as little concrete as possible in the house but all of the people I consulted said that we couldn’t use lime for this job as it wasn’t strong enough. 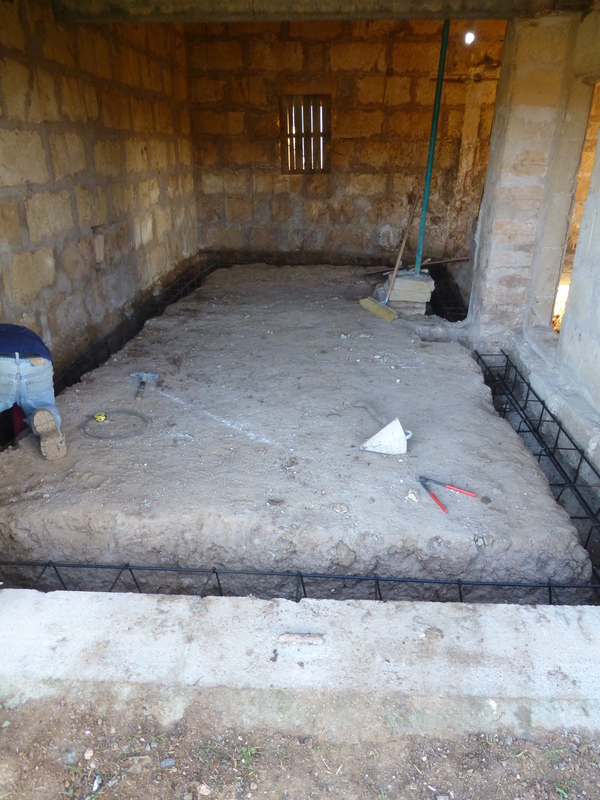 We dug a ditch all the way round the outside of the interior wall, placed a re-bar grid and filled with concrete. Once the concrete set, we dug out the rest of the earth down to a depth of 30cm and then filled it in with large gravel. This will stop damp rising into the building. On top of the gravel layer we have all of our clean water, grey water and black water pipes laid and the electricity has also gone in. I will give you more detailed information on all of this when i have some more time as some of you may be asking yourselves what the hell grey water is.. In the second week of work the digger arrived and started digging up the dirt track We dug down 30cm, laid stones that my neighbour has been removing from his nicely ploughed field for years and then put some sandy gravel on top. This is a great example of how “one man´s rubbish is another man´s treasure”. We got 8, 18 tonne truck loads full of stones almost for free, if we had bought the stones they would have cost us around 800€ so it worked out great for both of us. One thing to really be aware of when you have a digger moving earth is where you want to put the earth that comes out of the holes. There will be a lot more than you think! I had been told about this before but didn’t really pay much attention to it. We now have a dune that is 2.5m x 1m x 200m long. We have put it running along the north side of the property, so it gives us some immediate low level windbreak and a raised bed to plant trees in. Had I have planned it better we could have made it run on contour to soak up more water… you live and learn! Once the digger got finished with the road he started digging the hole for our water tank. 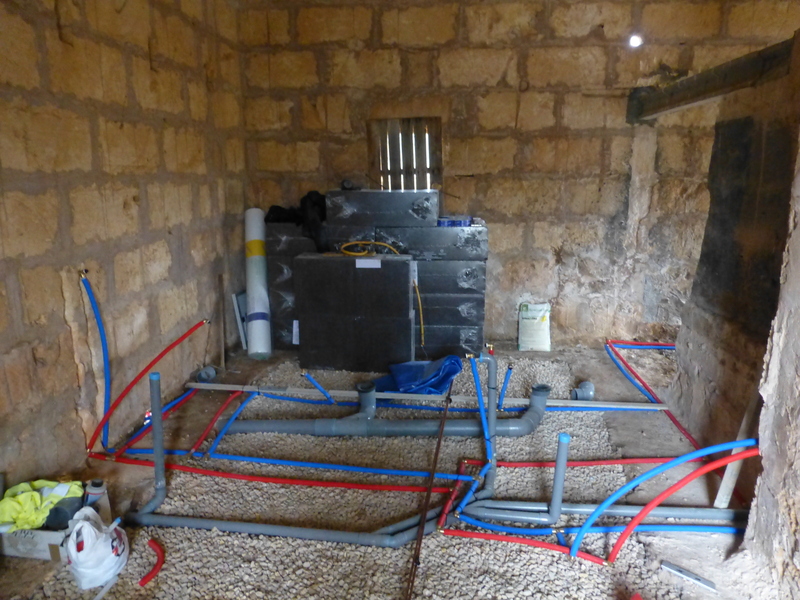 We will be building a 30000litre rain water tank that will be filled up from the run off from the roof. We have a well that is about 100metres away from the house that is hand dug by the original owner and only about 5 metres deep so we knew that the water table was very high in this area. We dug the tank about two weeks ago and it has slowly started to fill up with water. This may be a problem as we need it to be dry to make the slab for the base of the tank. We might have to wait till the water level goes down in the summer to be able to make the tank. We now have a gate! Up till now we just had a loose piece of fencing that we had to tie and untie every time we went to the finca so I am sooooo happy that we don’t have to do that any more. Its a nice sliding wooden gate with sandstone (mares) pillars. 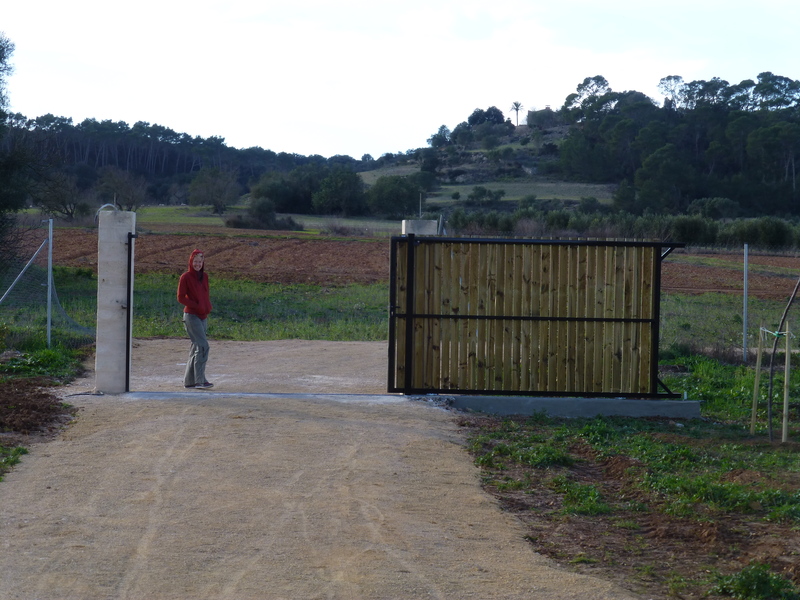 We went for a sliding gate as it was the best we could find for the money and it will be easy to automate in the future. The gate has really brought everything together and now it feels so much more like a house rather than just a fenced in field. Things have slowly ground to a halt over christmas which has given us time to go over our finances, take stock of everything that has happened and plan the next stage. We will be starting work again on Tuesday laying the insulated floor slab. We are using lime instead of concrete as its more eco friendly and its breathable which means that it deals with water and humidity better and improves the living standards in the building. This has just been a quick update to let you all know what has been going on. I will go into more detail on each subject sometime in the near future.